The Melbourne Cricket Club (MCC) and the Melbourne Cricket Ground (MCG) Trust have presented a billion-dollar plan to the Victorian Government that proposes a link between the MCG and the Melbourne and Olympic Parks. 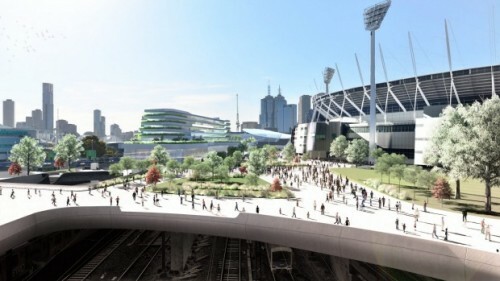 The ‘Sports Link’ plan proposes the construction of elevated pedestrian podiums stretching from the MCG to Richmond Station and a new hotel and health club, with later development to include decking of the railway tracks between the MCG and the Melbourne and Olympic Parks decked, with open space created for events in the middle. The premise of the study illustrating how “The Sports Link will secure Melbourne’s status as the world’s premier sports city and enhance its capacity to attract and host major international sporting and public events well into the future – in unrivalled comfort and safety”. The report also said the new connections and open space would compliment the expected redevelopment of the Great Southern Stand and also hinted at a new stadium close by. It said the new deck over the rail tracks would create development opportunities that would provide Melbourne Park with the option to relocate existing facilities and “free up land in Melbourne Park to better service the Australian Open and facilitate the redevelopment of a new stadium”. MCC Chief Executive Stephen Gough said the plan was to ensure the MCG and the precinct did not “rest on our laurels” and kept improving to stay contemporary and offer the best experience for visitors as Melbourne’s population booms. The vision of the plan is to unite the two halves of the Melbourne Sports and Entertainment Precinct currently divided by the Jolimont rail corridor and fill the ‘missing link’ between Melbourne’s premium sporting destinations. The report said if the enhancement work was not done at the MCG there was a risk “Melbourne might become less obvious as a global attraction in the face of efforts and investments by rival destinations”. Gough said safety was a critical issue, particularly with spectators walking from Richmond Station to the ground and heavy traffic on nearby streets. He stated that the plan maintained the option of an exterior security barrier around the ground and this would be looked at in the context of world events. The report said “of most immediate concern are the very real public safety and operational issues associated with entry to and egress from major events at the precinct – particularly the MCG and its connection through to Richmond Station and its capacity to cope with any increased passenger demands. “This issue is especially acute and top-of-mind in the context of global concerns for security at public events in a post Paris environment”. Gough said while the vision would likely cost at least a billion dollars no funding had yet been sought from the state government. 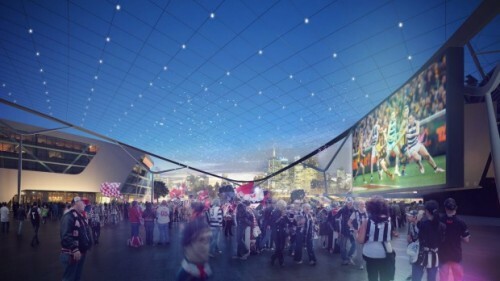 The project comes not long after Collingwood FC President Eddie McGuire proposed that a new AFL stadium to be built on the site of Hisense Arena. Responding to the proposal, Victoria Sport and Major Events Minister John Eren told reporters it was important infrastructure was up to date, but stopped short of committing government funds to the MCC proposal. We will not rule things in or rule things out but what we are prepared to do is discuss these issues. The MCC and MCG Trust consulted a wide range of stakeholders during the creation of the study, including the Department of Premier and Cabinet, Department of Treasury and Finance, Department of Economic Development, Jobs, Transport and Resources, Sport and Recreation Victoria, Major Projects Victoria, Melbourne and Olympic Parks, Vic Track, Public Transport Victoria, Metro Trains Melbourne, Yarra Trams, Melbourne Metro Rail Authority, Level Crossing Removal Authority, AFL, Tennis Australia, Victorian Major Events Company and City of Melbourne. Images: The proposed public plaza to connect the MCG with Melbourne and Olympic Parks (top), the plaza would cover railway lines (middle) and include live screens (bottom). Australian Leisure Management magazine is an Official Media Partner for our Stadia & Arena Asia Pacific 2016 event, being held in Japan’s Yokohama Arena this September.